​​In Haiti, the grade levels are K1, K2, K3, 1 – 13. The goal at Gandou is to offer an educational program to children so that they will be able to graduate from high school at Gandou. The last few years the education program has been expanding. In Haiti, the school can only increase one grade level a year. In the 2013-14 school year, the seventh grade was added. There has been a class grade added every year since then. So, in the 2018-19 school year, the twelfth grade was added to the program. With the adding of grade levels, comes the problem of where the students will meet to have class. Father Voltaire, the priest at Gandou, has had to initiate a two session school day because there are not enough classrooms for all the students to attend school at the same time. The kindergarten thru 6th grade classes goes from 7:00 am to 12:00 pm. Then 7th gr. thru 10th goes from 12:00 pm to 5:30 pm. This means the little kids are walking to school in the morning in the dark and the bigger kids are walking home after school in the dark. There are many kids that come to the school in Gandou that walk more than 1 hour to get to school. The problem with this is that they are walking on very steep, rough, rocky, and often muddy mountains to get to school. It would be very easy for someone to fall a very long distance or slide right off the side of the mountain. Father has told us where some of the kids come from to go to his school. We could not image sending little children out on this dangerous and difficult path malnourished, without breakfast, in the dark each day. The second problem with having school start in the dark and finish in the dark is that there is not lighting in the school classrooms. If it is dark outside, the school rooms are very dark. Very little school work can be done. If we were able to combine all the school sessions into only one session then it would not be necessary for school to start so early or end so late. Father Voltaire felt he could do this by adding 3 more classrooms. There is a proposed project of building 6 new school rooms. The new rooms will provide 3 more classrooms, library, teacher workroom, and storage room (for the team's equipment). When the team goes to Gandou then the following rooms can be used as: 1) library - private examining room, 2) teacher workroom – general examining room, 3) storage room – pharmacy. The project cost is about $75,000. The people of Gandou see education as one big way of helping their young. Over the years, the Gandou ministry has been expanding their involvement in the education program. •	Providing needed chairs, desks and supplies for students. ​Once a student has been selected for a scholarship, he/she signs a contract agreeing to certain criteria to maintain while in college. Then after graduation the student returns to Gandou and works for 2 years. (L-R)​Gerald Joseph, Estive Francillon, Daniel Noel. 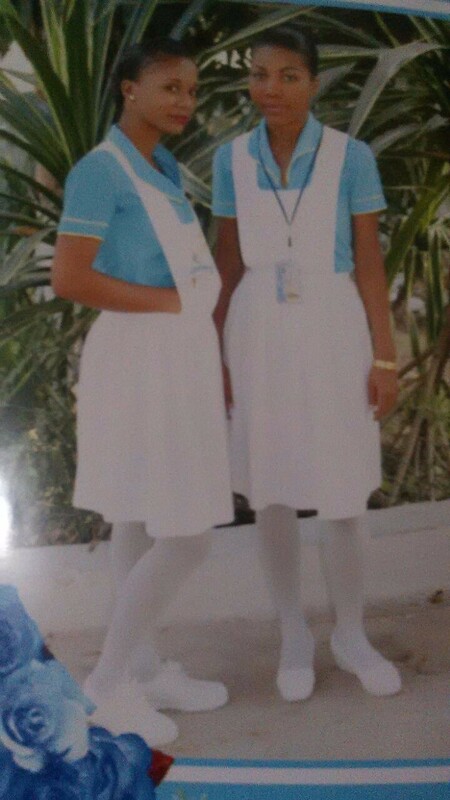 The picture on the left shows two of our nursing students: (L- R) ​Sibile Buisson, Nannecie Pierre. They started college in the Fall of 2015 at Notre Dame D'Haiti University in Port-au-Prince. They are scheduled to graduate in July, 2019. 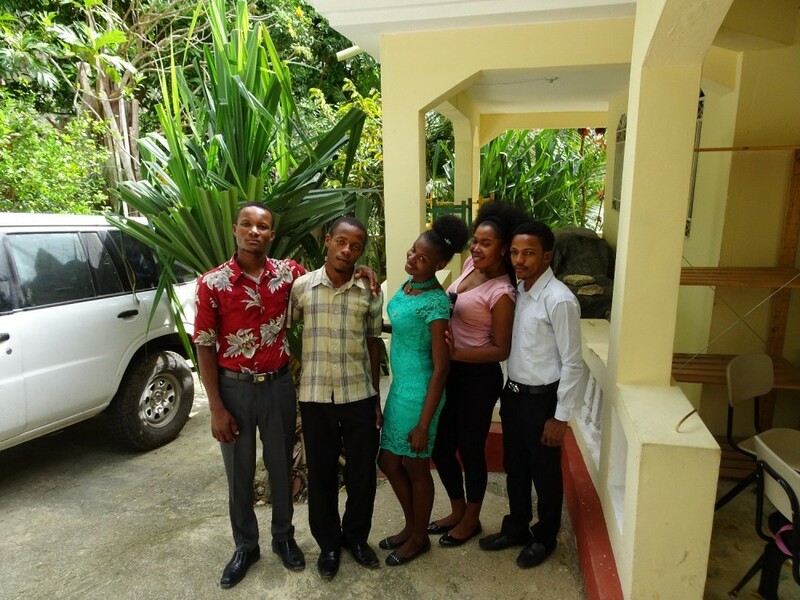 In the picture above are 5 more of our college students: (L-R): Christfe Augustin, Mackenson Laguerre, Missiana Saint-Vertu, Frantzcette Petiote, Wilson Laguerre. ​Christfe and Mackenson started college in the Fall of 2016​ at Quisqueya University in Port-au-Prince in the field of education. They are scheduled to graduate in June, 2020. ​Missiana and Wilson started college in the Fall of 2015 at Quisqueya University in Port-au-Prince in the field of education. They are scheduled to graduate in June, 2019. 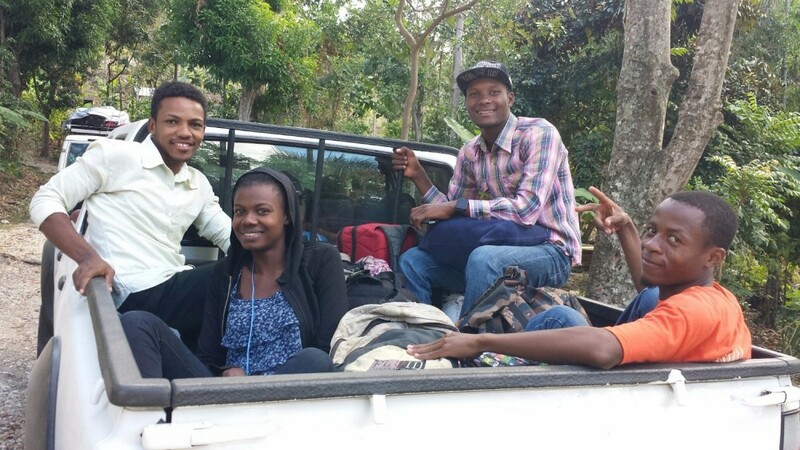 The picture above is four of our college students getting a ride back to college when the mission team was returning to Port-au-Prince at the end of the mission. The students were at Gandou helping the team for the entire week. 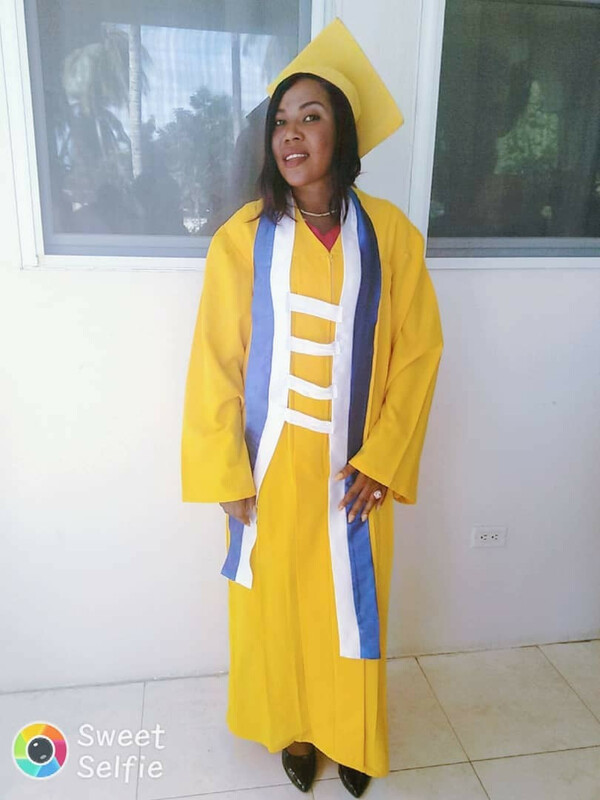 Frantzcette started college in the fall of 2014 at Norte Dame D'Haiti University in Jacmel in the field of nursing. She graduated in December, 2018.